Charles P. Gruppe, American. 1860-1940. ​​​​​​This painting by Charles P. Gruppe bears the exhibition label from the Cahoon Museum of American Art, Cotuit, Ma A Family of Artists: Gruppe Family, dated March 13 - April 29, 2012. During the 19th century and the 20th century, the Gruppe family contributed to the New England art scene by producing many artists including: Charle Paul Gruppe (1860-1940) and his sons Emille (1896-1978) and Karl (1893-1982). Charles Gruppe was born in Canada, and moved to New York State was he was ten. Primarily a tonalist landscape and marine painter, Charles Gruppe was largely self-taught although he spent time studying in Europe, eventually settling in Holland for a time where he developed his skill at subtle coloration and careful draftsmanship. Charles Gruppe returned to America becoming a painter and well as a dealer. His son, Emile A. Gruppe, was born in 1896 went on to become a famous painter himself. In 1925, after seeing a number of Rockport and Gloucester harborscenes painted by Frederick Mulhaupt at an exhibition in New York, father and son traveled to the Cape Ann area of Massachusetts. They fell in love with the location, set up studios and painted there for the rest of their lives. 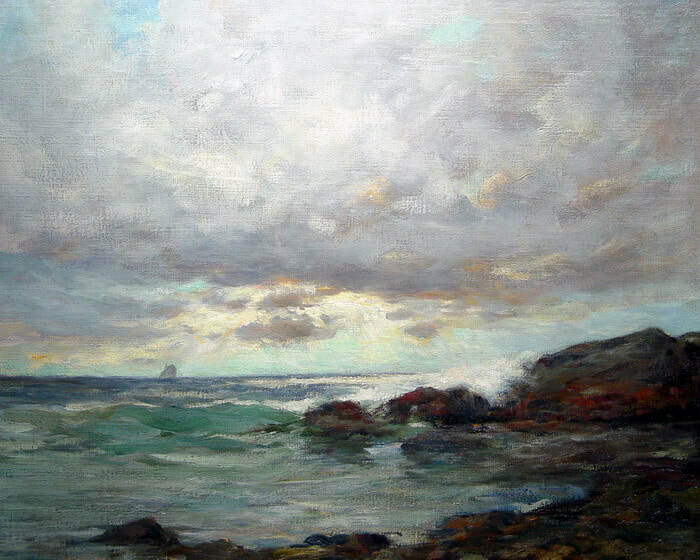 This painting exhibits the preoccupation that Charles Gruppe had with capturing the fleeting glimpses of sunlight as the lightbeams break through the clouds and illuminate an otherwise grey day at the shore.